Drew W. Billings. Acts of the Apostles and the Rhetoric of Roman Imperialism. Cambridge Press, 2017. 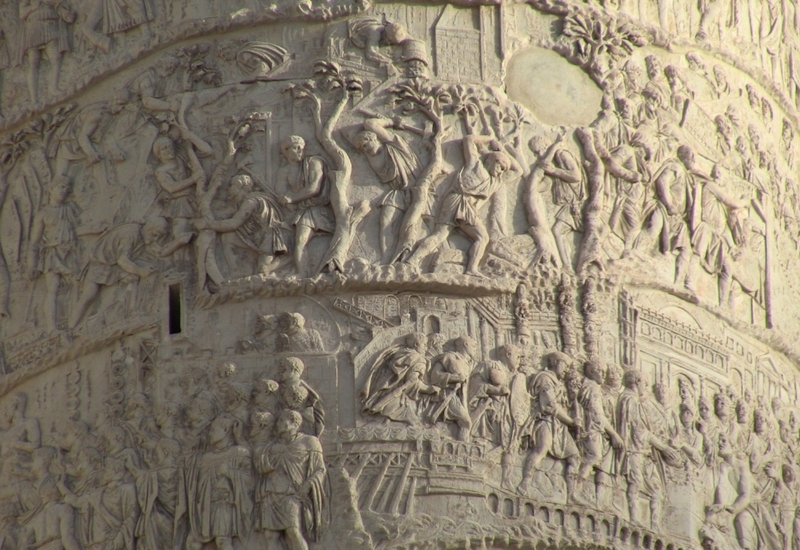 Trajan’s Column (completed in Rome around 113 CE) memorializes the Roman victory in the Dacian Wars of the prior decade, with a spiraling frieze that depicts over 150 scenes, ranging from battle and subjugation to mercy and infrastructure development, pictorially. In Acts of the Apostles and the Rhetoric of Roman Imperialism, Drew Billings places Emperor Trajan and the triumphal Column erected to honor his reign into conversation with the New Testament’s Acts of the Apostles. Billings’ central assertion is that the Column constitutes a text against which the output of Acts’ author can be read, even to the extent that historiographically, methodologically, and stylistically, it “provides the closest nonverbal analogy to the book of Acts existing from antiquity” (p. 27). Underpinning the study’s central arguments, however, are larger debates about Acts’ date of composition and disposition toward the Roman Empire. Billings dismisses one common dating of 80–90 CE as “nothing other than a scholarly compromise” between those who regard its author as an eyewitness to events of the 50s and 60s CE and those who would place the book later (p. 12). Without engaging at length with scholars preferring an even later post-Marcionic date, Billings locates Acts as a product of Trajan’s reign (98–117 CE) and its attendant multimedia culture. Turning to the author of Acts’ attitude toward Rome, he suggests that attempts to portray the text as univocally for or against Empire are inadequate. Billings instead characterizes the author—whom he regards as the “Luke” also responsible for the Third Gospel (p. 1)—as largely ambivalent. He actively participates in the Trajanic discourse about idealized imperial citizenship, leadership, and benefaction while imitating or hybridizing imperial methods of representation to write Christians and particularly its Apostle to the Gentiles into a position of acceptance and status (pp. 162-3). Successful argumentation on these questions would add fresh affirmation to the early second-century dating for Acts advanced on other compelling grounds by, for example, the late Richard Pervo and the Acts Seminar. The first chapter lays the foundation for the comparison of Acts and Trajan’s Column. For Billings, both “texts” venerate their male heroes in a continuous narrative style, with windows toward reality shaped by significant verisimilitude and the use of encomia to inspire praise, wonder, and imitation. While Acts and, to a lesser extent, the Column of Trajan have both been read historically as preserving an authentic record of events, Billings encourages readers to view Acts more in line with the propagandistic shaping of memory found in monumental historiography. A preliminary discussion of the Column of Trajan establishes its memorializing aims centered around the civilizing mission of the imperiumin general, and the benevolence of Trajan specifically. By comparison, Acts is interpreted as “a carefully crafted apostolic monument put in the service of early Christian self-fashioning” (p. 17). Billings often analyzes specific depictions from the frieze, featuring Roman soldiers, captured Dacians, or Trajan himself. The relevance of these visual data to Acts’ representation of leadership, benefaction, women, and so on, may raise concerns. After all, standing at a height of 35 meters, the Column is hardly a readable “text.” Fortunately, Billings nowhere imagines the author of Acts directly transferring themes from the Column to his work. Instead, Acts is fashioned to participate in the expression of imperial rhetoric and ideals illustrated in an exemplary format on the Column, but not unique to its “text.” One could extend Billings’ argument by employing a greater diversity of such monumental “source texts,” but his prioritization of the Column is very clearly tied to his dating of Acts and developments observable during the reign of Trajan (p. 190). The second chapter treats Trajan himself, focusing on how local benefactors throughout the provinces increasingly emulated the emperor’s virtues. In imperial rhetoric and self-representation, Trajan’s administration projected the values of generosity, liberality, and munificence. Billings notes that the emperor’s carefully crafted image as euergetes trickled down to shape practices of self-styling “as local versions of the emperor” (p. 70). Meanwhile, official imperial projects in the provinces focused on extending infrastructural expertise outward from Rome, but Trajan’s success in the region of Dacia also conferred benefits for the capital, inspiring a period of urban renovation and building projects that testified to the greatness of the Empire. Shifting from Trajan to Paul, Billings’ third chapter engages Paul’s activity in the provinces according to Acts—in Lystra, Ephesus, and Malta—and demonstrates how his dispensation of miracles shares the benefaction of God to new locales. The Paul of Acts thus conforms to the second-century emperor’s imitable example, and furthermore, comfortably associates in circles with Roman officials, governors, and soldiers, who consistently find no fault with him. Billings asserts that Paul’s provincial deeds qualify him as a model citizen, all the while bracketing the veracity of Paul’s Roman citizenship. Absent some remarkable epigraphic discovery, he notes that there is little new to offer on the matter other than reiterating that Paul’s supposed Roman citizenship is crucial to Luke’s narrative, shaping both its account of Paul’s later travel to Rome and its portrait of Paul as an idealized herald of divine benefits made available to far-off lands. Connected to Trajan’s example and the significance of euergetism during his reign, Paul’s healings and miracles indicate narrative investment in a consciously developed “trans-regional patronage network” precisely at a time when an expansionist empire increasingly promoted such benefactions (pp. 119, 127). Christianity, and Paul in particular, are thus construed as exemplary participants in the ideals of Roman society. Two further chapters extend Billings’ analysis, detailing Luke’s adoption of Roman anti-Jewish rhetoric and his presentation of masculinity in Acts. In a period when Roman authors portrayed Christians and Jews alike as deviants and undesirables, Luke willingly tapped into this rhetoric of misanthropy and in-group behavior for “the Jews” while seeking to exonerate Christians. Jews, for example, appear in the narrative as Paul’s primary opponents, and wield mob power even in places, like Thessalonica (Acts 17), where they were certainly a minority. Billings furthermore contends that Roman anti-Judaism reached a pinnacle during Trajan’s reign (pp. 147-9), and claims that Luke’s expansions on this theme represent an indisputable example of early Christian acquiescence to imperial rhetoric. Finally, though Luke-Acts stands apart from other Christian literature for the frequent appearance of women, he argues that their subtle disqualification from positions of leadership or speech reinforces male power—like images from Trajan’s Column, where expressionless women represent the pacification of the provinces. Men are instead the appropriate, divinely appointed leaders and virtuous guarantors of women’s peace and security. Luke actively suppresses observable examples of women connected to Paul serving in prominent roles in the early decades of the Jesus movement, and instead subjugates women through his exclusionary narrative (pp. 186-8). Though recent decades of scholarship have questioned the historicity of Acts, scholars working on this text often express a near-universal appreciation for Luke’s literary achievements. In this same vein, Acts of the Apostles and the Rhetoric of Roman Imperialism focuses on “representational choices” made in the active shaping of memory (p. 52), calling to attention its author’s awareness and employment of imperial rhetoric in fashioning his narrative. It also propounds a new “source text” through which we can filter and comprehend the appearance of Luke’s second volume. Perhaps most importantly, by contextualizing Luke’s work and especially the portrait of Paul vis-à-vis the reign of Trajan, Billings contributes to a growing scholarly case for the Book of Acts as a composition of the second decade of the second century. As a result, the case for Acts as a first-century production, whether near the life of Paul or some decades later, rests on increasingly untenable ground. Billings’ convincing argumentation carries important implications not only for the dating of Acts and the historical caliber of its narrative, but also for the elusive nature of Christianity’s disorderly first century and—if the two books emanate from the same “Lukan” hand—for the Third Gospel as well. Rob Heaton is a Ph.D. Candidate in New Testament and Christian Origins at the University of Denver/Iliff School of Theology. He can be contacted at rob.heaton@du.edu.